I don’t know how it happened, but the City2Surf is only five days away. Given that my preparation in 2016 has consisted mainly of eating croissants and ice cream in Paris and drinking hot coffee/chocolate/tea/anything-to-keep-warm in Iceland, I have a feeling this is not going to be the year I set a PB. In fact, for the first time in a long time, I’m mildly concerned about making it to the finish line with my body in one piece. I used to run the City2Surf without music every year and just take in the atmosphere. That was until a couple of years back I had an epiphany and realised that I can, in fact, do both. These days I just put together a little Spotify playlist (paying for the premium package was a very good decision), hit play and off I go. I usually keep one earphone in my ear and the other tucked into my bra so that I can hear everything that’s going on around me. Then when I need a little extra push I just stick the second earphone back in, dial up the volume and go for it. I like to have a couple of power songs reserved for Heartbreak Hill, but other than that I basically just like poppy songs that I can bop along too – I’m not so into worrying about what bpm a song has. Hey, you know what? Imma do you a solid and share my playlist with you right here. You’re welcome. Also, no judgement. OK, this may sound ridiculous, but mark my words, it is SO important. 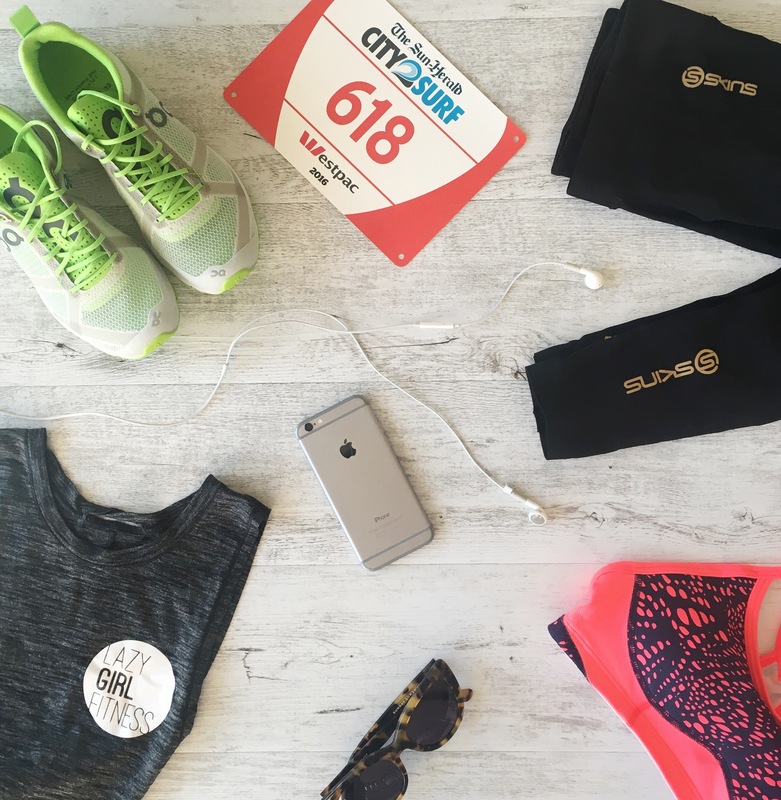 Race day is absolutely not the day to try out your new tights, and it’s definitely, 100%, absolutely not the day to break in your new sports bra. Chafing is a real thing and it hurts like hell. And noone wants their memories of the City2Surf was endless minutes of yanking up their tights. Same goes for hair accessories – last year I chose a shoddy hair elastic and it snapped about 2km in… that made for a fun next 12km or so, let me tell you! So I know that these are technically part of your outfit, but I still think they deserve their own subheading. If your shoes give you blisters on your training runs, they’re sure to give you blisters on race day. Same goes for arch pain. And any other foot or lower limb pain you can think of. Now isn’t the time to race in new shoes either – you don’t want any nasty surprises while you’re already focusing all your energy on not vomiting your way up Heartbreak Hill. Do not underestimate the importance of having a set-in-stone meeting point post-race. 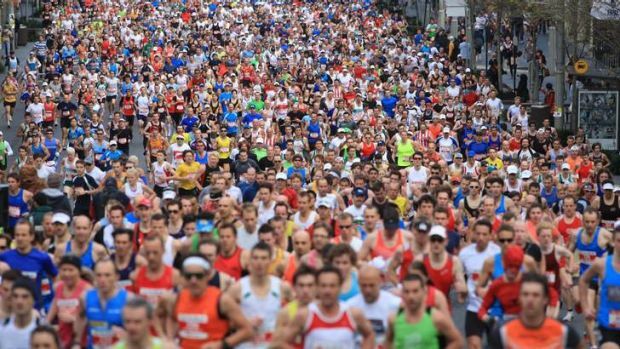 You might have romantic notions of crossing the finish line with your bestie, but contending with 80,000 other people along the 14km course could soon put a stop to that. Plus, it’s a race guys. There are no points for a tie. Think a super hot curry is a good pre-race dinner? It’s not. Want to add a few chillies to your night-before veggies? Don’t. Fancy a few beers to hydrate yourself on Saturday night? Here’s a tip: stick with water. The last 24-48 hours before you race is not the time to start experimenting with flavor combinations. You want to be hydrated (simple H2O will work!) and you want your tummy as settled as possible. Porta loos along the course are not a good time guys. For anyone who knows me, this tip might be a little surprising. But you know what? I LOVE the City2Surf. I love the atmosphere, the costumes, the hill (ok, I hate the hill, but I love finishing the hill), the fact that my family comes down for it and I love that my boyfriend will be at the finish line and I’ll get to eat a giant plate of bacon and eggs followed by Messina. It’s just a run, It’s just an hour or two from your life, and when it’s over you’ve got the whole day to revel in the fact that you have achieved this amazing thing. So don’t stress. Smile. And if you see me in my Lazy Girl Fitness singlet, give me a little push (I mean that in the physical sense if it’s somewhere on Heartbreak Hill). So I’ve written these tips specifically for the City2Surf, but to be honest, they’re relevant to any fun run on your calendar. And if you’ve got any more to share with me, please do it in the comments below (I need all the help I can get! ).